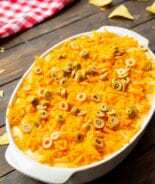 Traditional Seven Layer Salad ~ Perfect Make Ahead Salad or Side Dish for Holidays and Potlucks! 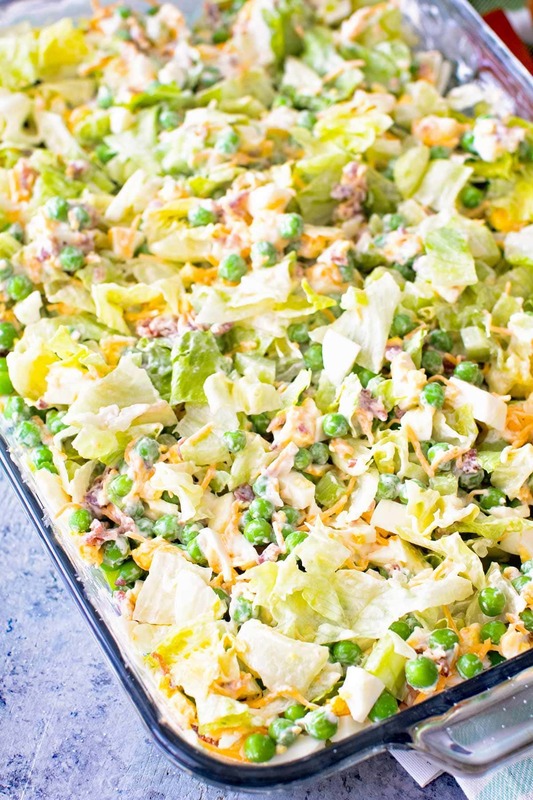 This 7 Layer Salad Recipe has Chopped Lettuce, Peas, Celery, Onions, Bacon, and Cheese! Is it just my family or do you have “staple” recipes at every holiday? 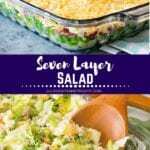 I can assure this Traditional Seven Layer Salad recipe is one of those! 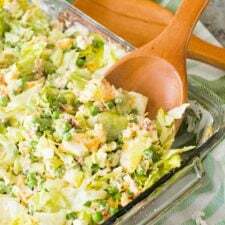 Layers of chopped lettuce, peas, onion, celery, bacon, hard boiled eggs topped with mayonnaise and sugar. Yes, I know. That mayonnaise and sugar layer kind of throws you for a loop but just trust me on this one. It’s amazing! Now, you might gasp at the next statement. I never knew how to make a seven layer salad recipe before the moment I made it for you! Feel special, ok? I do things just for you! Typically my cousin or my Mom bring it to every holiday and I bring something else. For some reason I let them get away with that because I thought it looked a little bit tedious. What on earth was I thinking? So easy! And it looks so pretty! If you want to feel really fancy layer it in a trifle bowl! My cousin is really the one that is “known” for her recipe for seven layer salad. 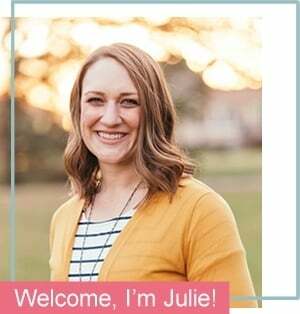 She typically volunteers to bring it aka we know she’s going to bring it to every holiday. I had asked my Mom for her recipe and wanted to compare my cousin’s version to my Mom’s. When I asked her for her recipe she said well I just toss it all in a pan and go by how much I want to chop or how little I want to chop that particular day. I had a good laugh. I didn’t think that would be real helpful for you. I teased her and said I’m going to list exactly that in my recipe and let ALLLLL the questions come your way for it then! I knew I’d have a ton of questions so I was figuring you guys would too! This recipe is super adaptable and easy. You can really adjust to it to your taste preferences. Add more, cut out ingredients, add different ones, really anything goes! In a pinch? By the packaged hard boiled eggs at the grocery store! I used these bacon crumbles instead of frying my own bacon. This is a big bag and I love having them in the fridge for throwing in recipes! I order them on Boxed.com. 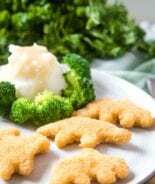 Mix things up by adding your favorite vegetables like carrots, broccoli, cauliflower etc. Get really crazing and add some ranch seasoning mix with the mayonnaise for a fun ranch twist! Make sure this sits for at least 4-6 hours or overnight before you serve it for that sugar to not be “crunchy” when you eat it. It will get soaked up into the mayonnaise layer and provide just the right amount of sweetness. This the perfect side dish or salad for your next holiday gathering, pot-luck or just because! I love that you can make it the night before so there’s less to do the day of your party. 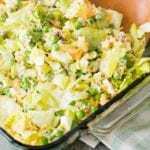 I assure you that everyone will love it and this Traditional Seven Layer Salad will become your new “go to” side dish! More of my favorite side salads! 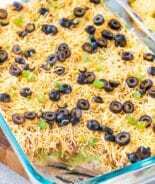 Traditional Seven Layer Salad ~ Perfect Make Ahead Salad or Side Dish for Holidays and Potlucks! 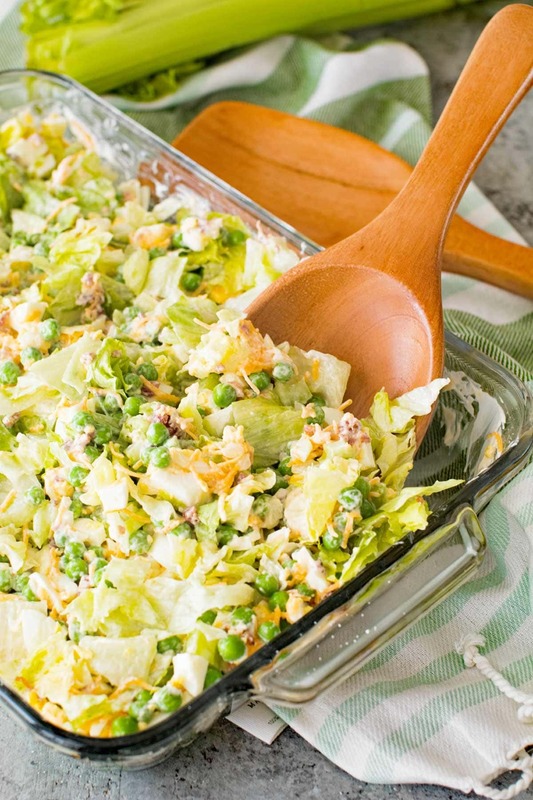 This Seven Layer Salad Recipe has Chopped Lettuce, Peas, Celery, Onions, Bacon, and Cheese! Spread chopped lettuce in the bottom of a 9 x 13 inch glass dish or trifle bowl. 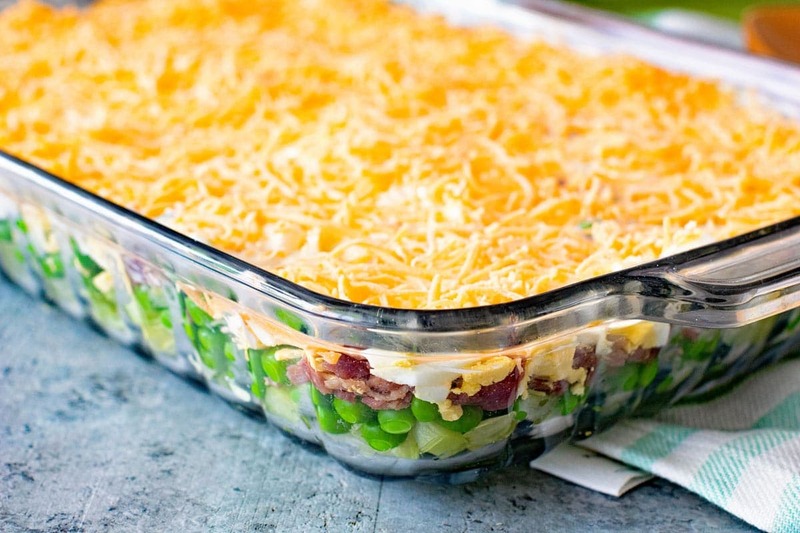 Top with peas, onion, celery, bacon and eggs. Spread mayonnaise over the top of vegetables. Sprinkle with sugar. Spread cheddar cheese over the top. Place cover on glass dish or seal with plastic wrap. Place in refrigerator overnight. This is one of the most versatile and delicious salads there are! Yours looks amazing! Such a staple at so many holidays! Never have heard it called that! So interesting how the same recipe can have so many names! Yes!!! We have this for almost every holiday and for good reason, it’s easy to make and tastes so good! 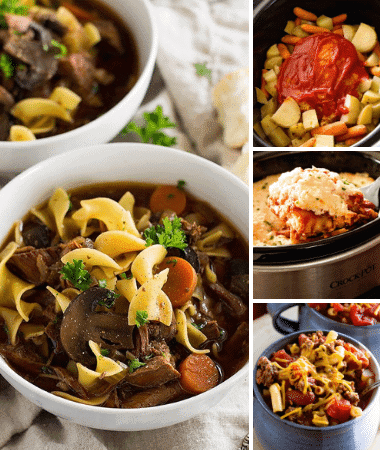 Such a trusted recipe by so many! I’m assuming the cheese goes over the Mayo mixture? Is this just before serving or before it is refrigerated? I add it before I refrigerate it. Either is fine! Yes! This is my husband’s all-time favorite salad! I make it for Thanksgiving and Christmas, but I should make it a lot more often! I actually never cook the peas. I just put them on top frozen and they thaw out while the salad is chilling. Another time saver! I’m all for that! Took two of these salads to Fellowship at church and only brought home empty dishes! Everyone thanks you! How many does the 7 layer salad recipe serve?can the sugar be mixed in the dressing rather than sprinkled on top? I think it would work fine to mix it in the dressing, but I have never tried it! I would say it serves about 10ish? Depends on how big of servings people want! You have just reminded me of one of my favorites that I haven’t made forever! Time to change that! Thanks for the recipe! This is going to be perfect for our holiday weekend party, thank you! this will be my first ever 7layer salad. I’m still don’t get the part of the Mayo. Spread it at the end or on each layer? Is it just Mayo for dressing or do I serve some extra on the side.? Spread it on at the end before the cheese! It’s a dressing. You’ll toss everything together after it refrigerates 🙂 Don’t serve on the side. Hi, I make this salad for the dressing I use 1/2 cup of mayo and 1/2 of sour cream mix them together then pour on top. Yummy salad thanks for reminding me about it! I always get excited when somebody brings a 7-layer salad to the party! It seems to be a staple at our parties too! This would be gobbled up at our dinner table! Or at a family party! So yummy! It’s a staple holiday dish of ours! I love this salad. 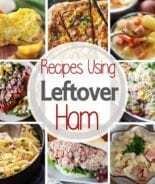 Great for potlucks! It’s always a hit at parties! 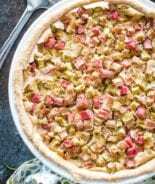 This is a year round favorite for all of our family get togethers! It’s a staple at our holidays too! I love it when people bring 7 Layer Salad to family events – and am really disappointed when they don’t. 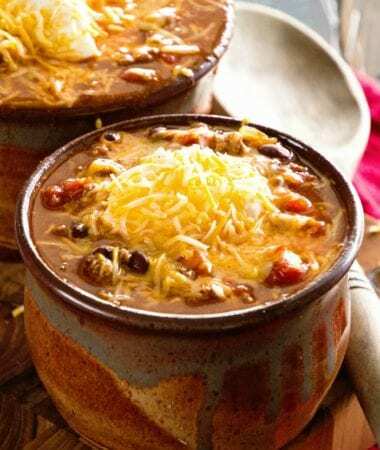 This recipe is just like the one my sister uses too and I absolutely love it! I omit the sugar and add Parmesan cheese on top of the mayo! 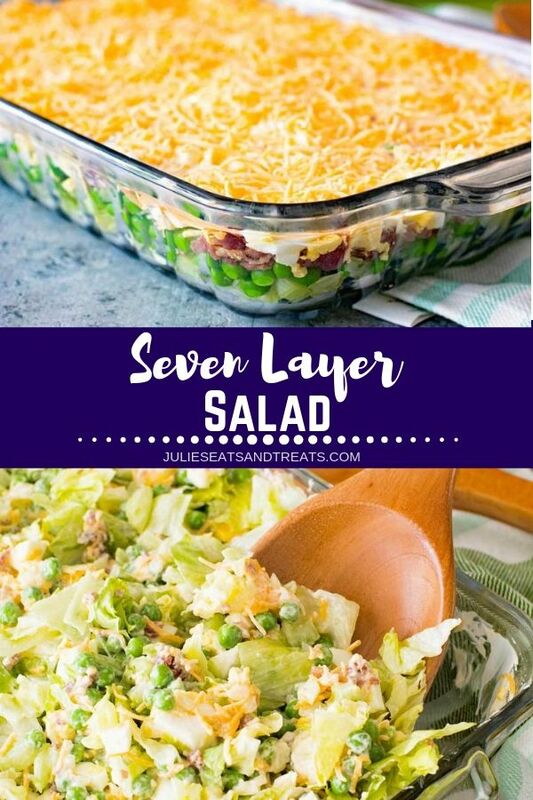 Love this 7 layer salad! Often times I even add cup up tomatoes for color!!! That’s another great way to make it. I’m going to try it! That would be a great addition. Maybe some cherry tomato. But I would leave out the onions. Love this salad. I don’t put celery in it. I put the bacon on top of the cheese so it stays crispy. If you prefer the taste of Miracle Whip, yes you can sub it out. Your recipe is identical to the one that my grandmother taught me to make, except instead of eggs, we used radishes. No holiday meal is complete without Mamaw’s seven layer salad. I’m feeling very nostalgic now. Thanks..
That’s awesome! I’ve never heard of using radishes! I add the sugar plus some grated parmesan cheese to the mayo then spread on top of the layers.